The smash hit Rock and Roll, Rhythm and Blues Musical "The Blues Brothers" comes to Cape Town's NewSpace Theatre on 1st July, 2009.
Who are the Blues Brothers? On the photo above you can see the South African performers Johan Baird and Alwyn Kotze. 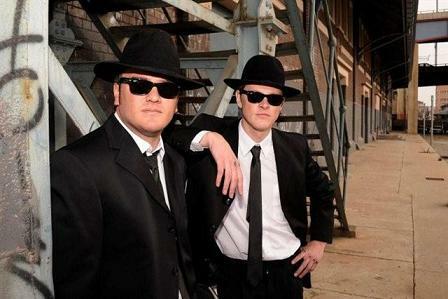 This award winning musical celebrates the music made famous by the pork pie and wayfarers duo, Jake and Elwood Blues in the cult eighties movie called "The Blues Brothers". These iconic kings of cool were created by the late John Belushi and Dan Ackroyd for NBC’s Saturday Night Live show and the subsequent film was made on the strength of the cult success of these characters. The first stage show of this popular musical was a 1980 musical comedy directed by John Landis and starred Belushi and Aykroyd as "Joliet" Jake and Elwood Blues. Musical numbers featured in this two-hour production include songs by singers James Brown, Aretha Franklin, and Ray Charles, amongst others. The original South African production broke box office records in Johannesburg and Durban. The Cape Town season is directed by Clayton Stewart, the original Elwood Blues in the SA show. The Choreography of the musical performance is by Quinton Jansen. The Blues Brothers with serious attitude are played by Johan Baird and Alwyn Kotze who are joined by three Bluettes, namely Capetonians Mono Dullisear as Mono Blues, Lyndle Kearns as Lyndle Blues and Crushanda Forbes and Crushanda Blues. •	When: July 1, 2009 until August 1, 2009. Performances: Monday to Friday at 8pm with two shows on Saturday at 5pm and 8pm. •	How much? Tickets cost from R85 to R135. Group tickets 10 persons or more cost R100 per ticket are available. •	Bookings: More info at claw@global.co.za or via the theatre information line on 074 1346636 or book via Computicket or 083915 8000. Are you interested in more great Cape Town Events? Then simply subscribe to my ExpatCapeTown Newsletter and be informed about the great upcoming events for the next month. Any questions or do you have to add another great Cape Town event to add to my Cape Town events calendar? Then please contact me.